These pronouncements are bold, but, until they’re backed up on the field, they’re empty. 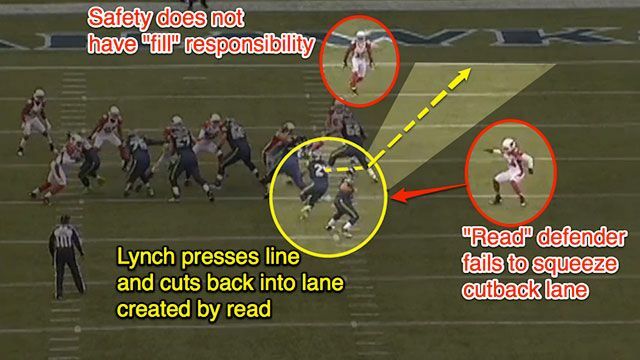 NFL coaches have been understandably vague about just how they plan to stop the read-option. Even with all of last fall to focus on answers, teams still struggled, which led to the question of where solutions could be found. The most common method of research was visiting with college defensive coaches who have spent much of the last decade locked in life-or-death struggles with the read-option. 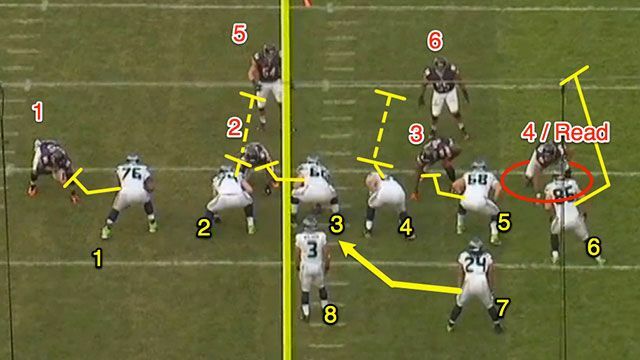 To stop the read-option, ostensibly a “college” scheme, NFL coaches have gone back to school. Green Bay head coach Mike McCarthy sent his entire staff to visit with Kevin Sumlin’s staff at Texas A&M, and Packers defensive coordinator Dom Capers separately spent time with Wisconsin defensive coordinator Dave Aranda, who faced Colin Kaepernick and his Pistol Offense for years at Hawaii and then Utah State. I’ve been told of visits from NFL coaches — some official, some very off-the-record — to schools as diverse as Stanford, Oklahoma State, Clemson, Alabama, Vanderbilt, BYU, and Florida State, where the primary topic of discussion was how to stop, or at least slow, the read-option. Pro coaches can spend as much time as they’d like searching for a magic read-option cure-all on college campuses. They aren’t going to find one. College defensive coordinators are as likely to complain about the difficulty of defending the multifaceted offenses so prevalent in college football as they are to claim they have all the answers. And a quick perusal of any Saturday afternoon games — or a statistics page — shows that the read-option is hardly being stamped out in the college ranks. The read-option poses real problems, problems that demand more than one solution. Privately, NFL coaches have admitted as much, but that doesn’t mean they aren’t still confident. No one believes the league will happen upon a single answer that can defeat these schemes once and for all. The confidence is a result of coaches rethinking the nature of the challenge. Intelligently defending a great read-option team is no different from defending a team led by a great “traditional” quarterback. When defenses face quarterbacks like Peyton Manning, Tom Brady, or Aaron Rodgers, they don’t show the exact same coverage every single play and assume they have “solved” those quarterbacks and their offenses. The only hope is to stay disciplined and react with a variety of looks, hoping not to stifle an offense completely, but to merely stay one small step ahead. Read-option plays force defenses to approach reacting to offenses much differently. With traditional approaches, the quarterback knows before the play whether he will either hand the ball off or keep it. In the read-option, the quarterback, typically aligned in the shotgun, will “read” the movements of a particular defensive player, one the offense has specifically chosen not to block. It’s based on this player’s actions that the quarterback makes his decision — hence the (redundant) term “read-option.” “Whenever the guy who takes the snap is a threat to run, it changes all the math of defenses,” Tampa Bay Buccaneers head coach Greg Schiano said in 2012. “It changes the numbers — minus one.” Last season, many NFL defenses repeatedly failed this basic calculus and tried to defend run games with six to eight offensive threats — blockers or potential runners — while undermanned by one, two, or even three defenders. The read-option forces defenses to bring in additional defenders to stop the run — but that’s only the first step.2 According to 49ers defensive coordinator Vic Fangio, on read-option plays, offenses are “not even blocking one of the guys at the point of attack, so it actually becomes 11 against 10 if they do it right. So, the numbers are flipped” (from a typical running play, in which the quarterback doesn’t have to be accounted for). Read-option plays get a three-for-one: They add an additional offensive player whom defenses have to worry about, allow the offense to get additional blocks and double-teams by leaving a frontal defender unblocked, and allow the offense to “block” a defense’s most fearsome defender — think DeMarcus Ware or Jason Pierre-Paul — with a player who has probably never blocked anyone in his life: the quarterback. Not all the problems with defending these plays last season were tactical. NFL defenders not used to the read-option frequently lacked the mastery of the subtle techniques that made them All-Pros against traditional attacks. 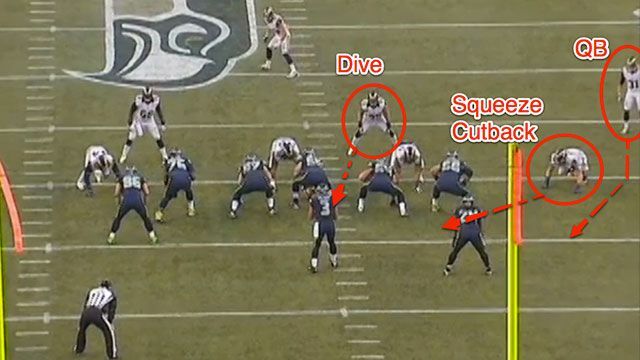 Backside defenders — usually the very player the quarterback is reading — have an especially difficult job. “The defensive end gets the shaft because he has to play two aspects: the dive, the bend of the dive to the inside out to the QB,” says Aranda, the Wisconsin defensive coordinator. This fundamental problem is also why the old just-hit-the-quarterback tactic is not optimal, at least as an every-down strategy. If the defensive end or linebacker gets upfield too quickly, that means he is not squeezing the cutback and may be opening up a huge lane for the quarterback. In defense of the NFL coaches, the sudden proliferation of the read-option in the NFL meant they had to get up to speed on a lot, fast. Unlike college defensive coaches, who got to watch the read-option slowly evolve over the past 15 years, NFL coaches were, almost overnight, asked to ace a 400-level read-option course, including all the mutations that took years to develop at the college level. The variation that did the most damage in the NFL last season can be primarily credited to Chris Ault, Kaepernick’s college coach and the architect of the so-called Pistol Offense, which the Redskins and 49ers and others then adapted to their own systems. This wrinkle, known as a “zone bluff” or “samurai,” in Ault’s terminology, adds another offensive player to the blocking scheme — typically either a fullback or a tight end. This player’s job is to “arc” around and block the outside linebacker — the very defender who will take the quarterback in the scrape exchange. 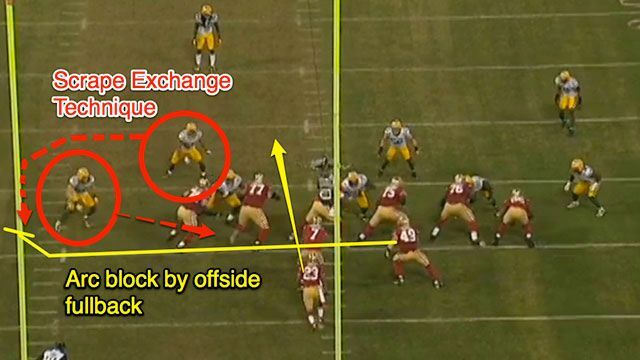 This is the play that incinerated the Green Bay Packers in the playoffs, when they were repeatedly outmanned and out of position in trying to stop San Francisco’s read-option-plus-a-lead-blocker attack. Even these higher-level read-option problems have answers, though. “The Will [weakside] linebacker widens with that [arc] block,” explained Mark Stoops, former Florida State defensive coordinator and current Kentucky head coach, at a coaching clinic. “The defensive end squeezes to the dive back. If the quarterback pulls the ball, the defensive end pursues inside to outside. The Will linebacker squeezes the arc and forces the ball back into the end. He wants to condense the space. 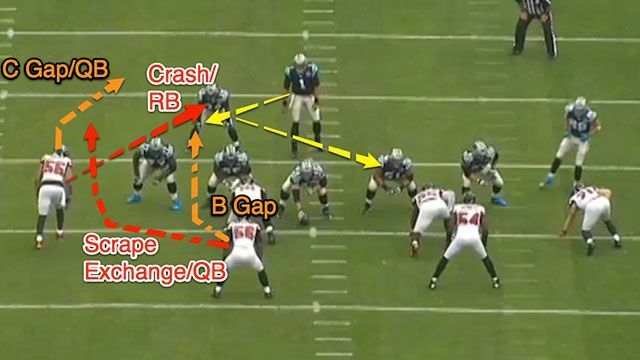 The free safety cheats down, fills the alley, and helps the Will linebacker play the quarterback.” To stop the zone bluff arc — a play that combines the finesse of the college read-option with the power-based blocking the NFL adores — defenses must similarly use tactics and personnel that combine speed with strength. So long as the battles are on notepads and whiteboards instead of on the field, both offensive and defensive coaches can claim the upper hand. But when the season starts, there will be trade-offs — on both sides. For defenses, a commitment to shutting down the read-option necessarily creates potential problems elsewhere. “There is,” according to Stoops, “a weakness to every call we make.” The goal is to hide and vary the weaknesses. But that doesn’t mean NFL defenses won’t blitz much this season. I fully expect defensive coaches to be far more aggressive against the read-option this fall, although — unlike many of their schemes last season — those blitzes must be “option sound” and have defenders schooled in the proper techniques assigned to each potential runner. The read-option doesn’t eliminate blitzing, but it does eliminate some of the crazier blitzes — five defenders to one side or three defenders in the same gap — that had caused problems for traditional attacks. Of course, the trade-off for offenses who use these plays is obvious — if your quarterback is a potential (or actual) runner, then he will potentially (or actually) get hit by very large, very fast defensive players. This, as much as any tactical challenge, seems to be the real reason NFL defensive coaches aren’t quaking at the prospect of the proliferation and improvement of schemes they really had no answer for last season. “The problem is for those quarterbacks, one of these days one of them is not going to walk off,” Detroit Lions defensive coordinator Gunther Cunningham said recently. “It’s a lot of pressure on him to physically do that.” The NFL writ large — coaches, general managers, other executives, and owners — have spent the past 30-plus years devising increasingly elaborate ways of doing two things: (1) paying quarterbacks more, and (2) protecting them on the field, through both scheme and rule changes. The read-option makes the quarterback a constant target. This reality may very well lead these plays to vanish, but there’s also plenty of reason to think that, executed correctly, they pose no more risk than a traditional pass play, during which a quarterback — eyes focused downfield, arm extended, unable to protect himself — is a sitting target. A properly restrained quarterback should slide or get out of bounds essentially anytime he pulls the ball on a read-option play, and a major reason why NFL teams like Ault’s arc blocking scheme is that it adds a personal protector for the quarterback. All of this will be settled where these questions always are — on the field. Five years from now, NFL offenses might be unrecognizable to a fan from the 1990s or 2000s, or the read-option could be a distant memory, a short-lived aberration. That extinction would start now, following an offseason during which the NFL’s best defensive minds operated with the single-minded goal of shutting down these plays. The lower levels of football are always going to be more experimental than the inherently conservative NFL, as hundreds or even thousands of teams, many of them lacking even basic resources, grasp for any advantage they can get as part of a collection of teams with disparate talent. Rich Rodriguez famously said his staff invented the zone read at lowly Glenville State because they were “just trying to get a first down.” NFL teams, by contrast, are awash in facilities, technology, a relatively open market for players, and, maybe most important of all, time — time for coaches, who don’t have to zip around the country recruiting, and for players, who are full-time professionals. And yet, for an idea to be an essential part of football history, it must be able to withstand, and evolve in response to, the scrutiny of the all-day, every-day nature of the NFL. If it dies out, it dies out, and the answers that defensive coaches developed for it this offseason will be added to their permanent repertoires. But if the read-option can stand up to that onslaught, it means a concept born on the dirt practice fields of backwater colleges will have become entrenched at the highest level of football, in a form and status its creators never thought possible. The numbers back this up. According to data collected by Football Outsiders, read-option-based plays (defined loosely, with undoubtedly some error in identification due to a lack of knowledge about the exact play calls) averaged roughly a yard and a half better on a per-play basis than other NFL rushes — a staggering number. One of the main reasons the so-called Wildcat was effective for only a short time is that once defenses committed sufficient numbers to the run, offenses couldn’t turn to anything else. This is because the Wildcat runner was neither a passing threat nor a player reading defenders. He was just running. The read-option, when run by quarterbacks like Russell Wilson, Kaepernick, Robert Griffin III, and Cam Newton, presents a different challenge. In the 2011 playoffs, the New England Patriots decimated the Tim Tebow–led Denver Broncos with the scrape exchange. Denver’s staff — which had installed read-option plays on the fly over the course of the season — had no ready answer.